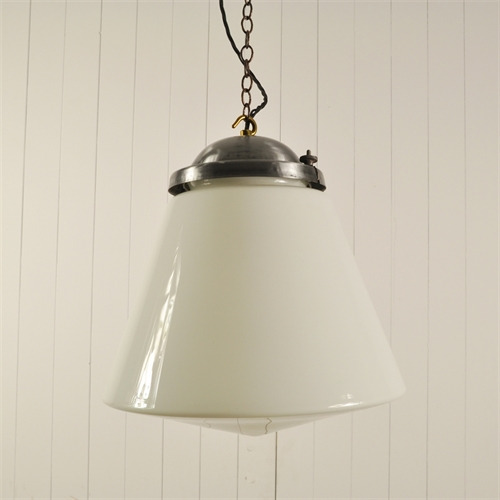 These vintage opaline glass lights are circa 1950's and were sourced in the Czech republic. We love the crisp shape of these. The galleries have been stripped, polished and lacquered and the electrical fittings have been replaced with new Brass B22 bulb holders. These are sold wired with black triple braided flex and chrome chain and ceiling hook. These are Sold but there are potentially another 10 available on request with a lead time. 38 cm h x 34 diameter.